Carnitas Benedict at Local Traveler. Local Traveler is the new restaurant from the team behind The Lot and the chef from the late and lamented On the Lamb. They have endeavored to create a sophisticated experience without pretense, and in a lot of ways they have succeeded. The menu is definitely chef-driven, but nothing is too intimidating for a less adventurous eater. The brunch menu is chock-full of options, ranging from more breakfast-friendly choices like pancakes and egg dishes to more lunch-y options like tacos and sandwiches. 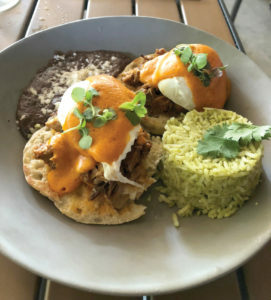 A carnitas benedict was colorful, with beautifully poached eggs topped with a red chile hollandaise. Green rice and black beans rounded out the plate. This was one of those dishes that you spy on a neighboring table and ask about it because it looks so appealing. The flavors are also satisfying, with the smoky, tangy hollandaise accentuating the sweet and spicy pork. A chicken salad croissant may have been slightly less exciting to look at, but not any less tasty. The croissant was flaky and buttery and the chicken salad was a little sweet with apples and grapes, which were nicely balanced by a garnish of frisee. Plantain chips were paper-thin and crispy. Dinner was slightly less successful, not due to any lack of quality but, instead, an odd lack of attention to detail evident in the dishes we tried. Duck confit arrived at our table missing butter-poached olives, which would have added salt and balanced the richness of the duck. Our server brought us a dish of them to try, but we were finished with the dish by the time they got to us. The timing of courses was also off at dinner; our salads arrived before we finished the previous course, rather than after the first plates had been cleared. Our server did apologize for the weird pacing and assured us the rest of the meal would not be as rushed (it wasn’t). For our salad we tried the pea shoot panzanella, which was another anomaly in a place so attuned to so many details. A panzanella is a bread salad, with cubes of grilled bread as the main component. This was a pea shoot salad, with a few crunchy bread pieces — more like croutons — scattered throughout. The shoots were also very difficult to eat without getting vinaigrette all over your face. Entrees were mostly spot-on. Seared salmon was a perfect medium-rare and sides of forbidden rice and bok choy were fine. Blistered tomatoes were cold (not sure if that was on purpose) but had a lovely jammy texture. A pork shank was falling off the bone and sat atop a pile of gorgeous thyme-scented white beans, making the whole thing a play on the French cassoulet. We took half of it home and it was only better the second day. I’m not one to complain about an oversized dessert, but the blueberry lemon cheesecake was so large it was comical. It’s the perfect size for a party of four at the end of a multi-course meal or two that have shared a salad. The blueberry compote wasn’t overly sweet, and the cheesecake layers were creamy and tangy. I love the addition of thyme and black pepper to a dessert — it’s what will set this dish apart from other similar versions. Service is very nearly impeccable. Servers and waitstaff on both visits were friendly and attentive without being overbearing. I was thrown off by a host greeting me with “how can I help you?” when I walked in. I understand that not everyone is there to eat — there were people just having drinks at the bar — but it seems odd and unwelcoming. The atmosphere is elegant without being stuffy, like a social club you might read about in a Sherlock Holmes story. And with a large patio and a location that’s much more appealing to drive (or bike) to than Oak Cliff or even Deep Ellum, Local Traveler is sure to become a neighborhood favorite. They also have the goods to entice people from other areas to venture this way. Monday to Thursday 4-11 p.m.
Saturday 10 a.m.- 12 a.m.
Sunday 10 a.m.- 11 p.m.